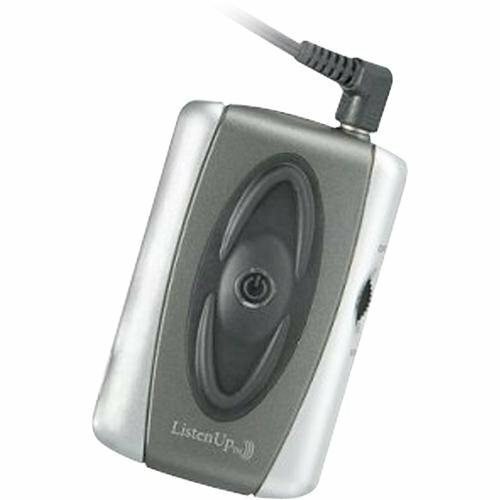 Listen Up Personal Sound Amplifier Turns ordinary hearing into extraordinary hearing! Comes with comfort fit ear buds. So powerful, you can hear a pin drop across the room! Enjoy conversations, music, TV and theatre without struggling to hear. Listen UpTM has a compact amplifier that captures and amplifies sounds that are usually hard to hear. Simply wear the comfort-fit earphones and use the volume control switch to select the perfect level of amplification for you. Hear a conversation or watch the game from across the room. Ever wonder what people are talking about across the room? With Listen Up, you can discreetly listen in. It's so powerful, you can hear even the softest whispers loud and clear. Compact and completely portable.The amazing Listen Up is smaller than a credit card, so it fits easily in your pocket or clips to your belt. To use it, simply insert the earphones and adjust the volume to the desired level. It's that easy! Now you can turn a TV or radio down to low volume for other people in the room, and turn your Listen Up to high volume for yourself! Great for the gym, church, playground, during walks and great for hunters too. Uses 1 AAA battery (included). Listen Up measures 2 3/4" x 1 3/4". Comes with comfort fit ear buds. If you have any questions about this product by BuyDBest, contact us by completing and submitting the form below. If you are looking for a specif part number, please include it with your message.